10x8 Glossy Photo Picture Print. Printed In A Fujifilm Professional Photo Lab On Crsytal Archive Paper. Nach Farbe filtern Handys & Kommunikation (177). Computer, Tablets & Netzwerk (62). Sie werden in Zukunft nur noch dieses tolle Set von der MarkeLACOSTE benötigen. 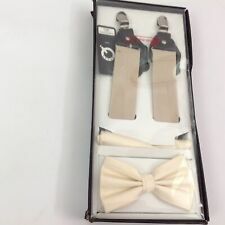 Mit dem LACOSTE Classique Gift Box Beltsehen Sie nicht nur gut aus, sondern genießen auch den besten Tragekomfort. Authentic Gucci Set - Wooley Hat, Scarf & Sunglasses. Items are used but in very good condition due to not being worn much. Hat & Scarf was purchased for £305 as shown in receipt, Sunglasses was £160 ( lost receipt ) £175 ONO - Dispatched with free Royal Mail 1st Class shipping. It is not real lizard skin finish, it is lizard skin effect so looks and feels like reptile skin which is nice to touch. Nice to touch lizard skin effect (fake) finish. 6 individual watch cushions and 12 cufflink slots for smart and safe storage. Official Space Invaders Bath Set. Boxers size SML - waist 29-32". Thermo Tex Hat & Scarf Set. It is a plain navy blue hat and scarf set. I don't normally wear ties (being retired) and don't own any dress shirts, needing cufflinks. 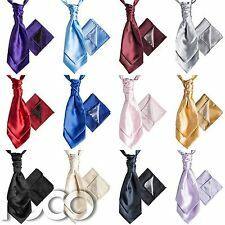 Material : 100% Polyester (tie). ED HARDY BALL CHAIN SKULL AND DIE TRYING PENDANT NECKLACE 24" STAINLESS STEEL. Superdry men’s Lineman gift set. This gift set, consisting of a simple fabric belt and a tri-fold wallet is the perfect gift for the man in your life. The belt features a coated metal buckle with an embossed Superdry logo and is finished with a metal end panel to prevent fraying. The tri-fold wallet has a hook and loop fastening and features a large note pocket, five card slots, a small zip fastened coin pocket and a handy keyring that can be used to attach it to your jean belt loop. The wallet is finished with a rubber Superdry logo on the front. This is a genuine Superdry item for sale. One Size Brand New with Tags. Dispatch within one working day. Thank you for looking. Returns Policy: Please note I do not accept returns. It is not real lizard skin finish, it is lizard skin effect so looks and feels like reptile skin which is nice to touch. Nice to touch lizard skin effect (fake) finish. 12 individual watch cushions for smart and safe storage. A perfect finishing touch to a Countrymans attire. Joules Mug & Fluffy Sock Gift Set. 1 pair of warm fluffy socks with a green and navy striped pattern and mustard toe and heel. With Gift Box. Great Gift Idea for the Outdoor Lovers. Capacity: 350ml. VERY PRACTICAL & STYLISH. Complete with soft touch faux leather casing. It is not real lizard skin finish, it is lizard skin effect so looks and feels like reptile skin which is nice to touch. Nice to touch lizard skin effect (fake) finish. 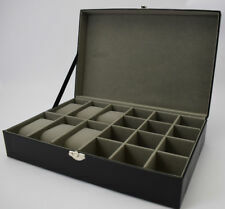 This nice quality storage box by Harvey Makin makes a great gift. A lovely hat in used but good condition,any questions please ask. Contains 7 Essential Oils and a blend of ginseng,ginkgo biloba and guarana to give you a burst of energy. 2 X WOOL BLEND PERUVIAN HATS. Model NO. : 2212. Water Resistance: Life Waterproof,not for shower,swim and dive. 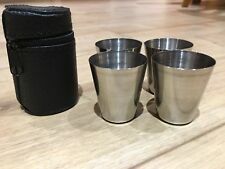 Band Material: Stainless Steel. Clasp Type: Foldling Buckle. Battery Type: SR920SW. Band Length: about 245mm. Band Width: about 22mm. Superdry men’s Premium gift set. This premium gift set is ideal for the modern man with a matching leather belt and three-slot card holder. 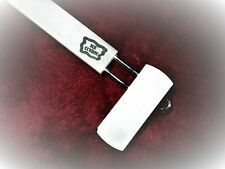 The belt features a roller buckle belt and is finished with a subtle Superdry Premium logo on the end. The nifty card holder has a debossed Superdry premium logo on the front and is finished with stitching around the edges. This is a genuine Superdry item for sale. Medium - 90cm Brand New with Tags. Dispatch within one working day. Thank you for looking. Returns Policy: Please note I do not accept returns. RED TARTAN SCARF. & NAVY BLUE GLOVES SET. FABULOUS GIFT! Wire weave is silver plated copper and grey coloured silver plated copper. the eye with wire weave is 3x3. 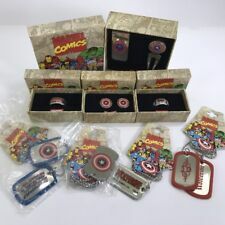 Ben Sherman Tie, Pocket Square, & Lapel Pin Set - New!